Illustrator and chicken-lover Lauren Scheuer is a Facebook friend of George’s and mine. George and Lauren have even skyped to discuss chicken maladies, swap cute-hen-stories, and show off their animal families to each other. As soon as I found out that Lauren was having a book published I pre-ordered it. And the minute Once Upon a Flock: Life With My Soulful Chickens arrived I rushed it up to George, and he pretty much read it in one sitting (well, lying…). A Love Story Like No Other …. If you are wondering what it is about the backyard/small-flock revolution going on today, this absolutely charming book will spell it out for you. For those of us already in this mess, you can’t put it down. Your mind keeps saying “Yes!” and “YES!! !” again and again. And you find you have fallen in love with her hens as well as your own, again. And if you as yet do not have hens, you will find yourself wanting to adopt a family of girls for yourselves. This is a book to enjoy alone, with your family, and with your hens too! Lauren deeply loves her accidental second family. She pinpoints precisely the moment that she realized she had been changed forever. I remembered along with her, as I was reading, the same moment for me when I had my long-since gone Divine, a beautiful Leghorn, lovingly settle up next to me and I knew I could never eat chicken again. Lauren has mastered writing as well as illustration. Both complement each other all through this book. I won’t spoil one of the nuggets of this book, except to say that Lauren captures the truth about real love: it is indeed a horse or a bicycle that you unwaveringly get right back up on. And I’m sure Pigeon is forever emblazoned in our hearts as a result. It made me love Lauren for the wonderful heart she is; a place I’m sure everyone reading this book will find themselves. One reservation is that this book will get worn out from repeated reads far too soon, and a second copy will be in the cards. Wabi-sabi aside, my only real reservation was that it ended too soon. BUT, paradoxically, it ended at exactly where it needed to end. I found that kindred spirit in seeing that everything really important to the reader is right in your backyard. Maybe that’s what it is for hen people, like myself. You can’t ever get enough. And it is, at the same time, all you need. Time spent with your hens as well as with this fabulous book is time spent well, indeed! Congratulations, Lauren. 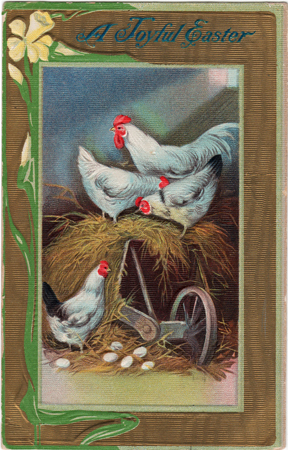 The second card was mailed to Ada May in 1913, with no message other than “From Auntie Jones.” I love the jumble of peeps scampering from an egg in a field of lilies-of-the-valley. I especially value these old postcards that are embossed. 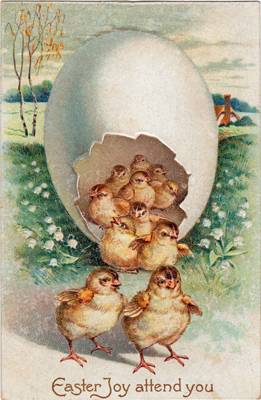 On this one, each chick is individually embossed, as are the flowers, and of course – the jagged edges of the egg.